This week Breitbart revealed what is a fairly obvious campaign of censoring conservative accounts by Twitter. Rather than simply hiding or blocking them (because they were busted for doing that earlier this year), content in conservative tweets is mysteriously triggering the sensitive content filter. And it’s clear they’re doing so because the Drudge Report’s tweets — which are simply reposting news headlines — all show up as hidden due to sensitivity, regardless of the actual content. If that isn’t patent proof of bias in action, then nothing is biased. The question going into the midterm elections is whether and to what degree Twitter, Facebook, and Google are going to increase their efforts to censor conservative messaging. Twitter, a social media platform that regularly finds itself in scandals involving bias against conservatives, is now hiding innocuous tweets from President Trump and his son, Donald Trump Jr., behind content filters. One of the filtered tweets, from Trump Jr., was critical of Twitter’s uneven enforcement of its terms of service. The filtering appears to have been triggered by the retweeting of @DRUDGE_REPORT. 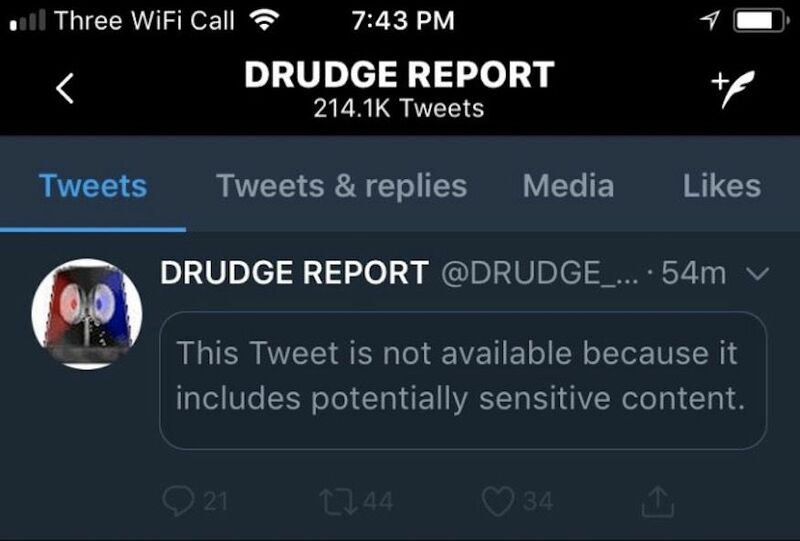 Users navigating to the account’s page, which automatically posts links from the website of the Drudge Report, will find that all tweets from the account are hidden behind the same “sensitive content” warning message. Users who wish to ensure that they continue to see all tweets from the President, Donald Trump Jr. and @DRUDGE_REPORT will have to manually disable their content filter. This can be done by unchecking the box marked “hide sensitive content” in your safety settings.